A kata is a sequence of movements which contains a series of logical and practical techniques of attack and defense. In each kata there is a predetermined number of moves that the student can practice alone. 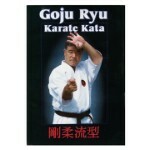 The Goju-Ryu kata were created by various Masters and are based on many years of experience and research and combat. All kata begin with a defensive technique, which conveys the true spirit of its meaning. In addition to not provoke the attack, no karate, the best defense is always avoid combat . The FIM to properly train the Kata, their movements should be practiced repeatedly , for thus only can improve and control its execution. The advantage is that this practice can be done without an opponent, at any time and anywhere. Almost all the kata of Goju-Ryu were transmitted by Sensei Higaonna Kanryo,à excepção das katas Gekisai dai ichi, Gekisai or dai, Tensho e and current version of Sanchin, a principal kata do estilo. There are two groups of kata of Goju-Ryu: as e as fruit juice Heishugata Kaishugata. As katas heishugata Literal significam 'Kata fists’. In fact the meaning is the constant state of contraction maintained throughout the kata, this is, 'Close’ or contract the muscles. This type of katas develops physical Fork, resistance and breath control. As a SAP São heishugata Sanchin e and Tensho. As katas kaishugata Literal significam 'Said de mao aberta’. In this type of kata muscles remain 'open’ or relaxed allowing quick movements and fluid. The contraction of the muscles of the body and the concentration of power comes at a time of execution of each technique. All the other Kata of Goju-Ryu, except Sanchin and Tensho pertencem this category.